The submersible motor is a highly engineered device that is unlike any other motor in the world. It has to live deep underwater and survive extreme pressure, electrical surges, and up to thousands of pounds of downthrust. An exemplary submersible motor is a three-phase induction-type motor, having a shaft rotatably mounted within the housing such that it is in general alignment with the axis of the wellbore when residing in the wellbore. Presently, a variable frequency drive may be used to control the speed at which the submersible motor operates and to facilitate an overall increase in efficiency of operation in an electric submersible pumping system. A typical system comprises a pump, an electric motor and a motor protector deployed in a wellbore. The submersible motor can be used to power components, such as the pump, to permit pumping of the production fluids to the surface or some point above the surface of the earth. A typical submersible motor, used to pump production fluids from beneath the earth's surface, has an outer housing substantially sealed from the production fluid environment and sized to fit within standard wellbore casings. However, variable frequency drives can create undesirable harmonics. For example, certain harmonics created by the operation of the motor cause problems such as voltage distortion, zero-crossing noise, overheating of transformers, nuisance tripping of circuit breakers, and over-stressing of power factor correction capacitors. Additional losses arise due to huge impact current at start and heavy mechanical wear to the pumps. Since the oil well's geologic structure is extremely complex, and margin of the submersible motor is always designed comparatively higher, the pump is more inclined to be damaged, especially when the well is thin in oil reserves. 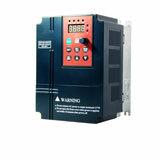 The VFD has the soft start function, which can dramatically reduce the counter potential and impact current at start. The power factor of the new system can be greatly increased no matter when the load is light or heavy. Especially under the light load condition, the reactive power is dramatically decreased, such that the system has excellent energy saving capacity. The system can adjust the oil output capacity as per the oil well's actual status, reducing fault rate and enhancing working efficiency. The new system also can realize pressure and temperature closed-loop control. Please refer to the diagram above. This system adopts the diode clamp three level technology, which has being lauded in the developed countries since the eighties last century. Gozuk is offering 1140V-2300V medium voltage VFDs which are quite suitable to the system. Field operation shows that the medium voltage VFD modulated system has successfully eliminated the harmonic obsession. Moreover, the top quality VFD greatly enhances reliability of the whole system. Less harmonic content: The input terminal of the VFD adopts the phase-shifting transformer superposition technology, which can efficiently suppress harmonic content of input current. And the output terminal adopts the power unit (3~9 units) serial connection technology, which guarantees the output waveform more close to the sine wave. No particular requirement on the motor to be driven. No need to install power factor compensation device. The power factor always exceeds 0.97 at rated load in the range of normal speed regulation. Total system efficiency hits as high as 96%. The pre-charging circuit in the high power VFD can eliminate inrush current at start. It is suitable to all the low-capacity grid and peripheral devices. Perfect self-analysis system can online monitor the operating status of the VFD. It can automatically introduce protective measures and record the operating parameters in the event of fault. 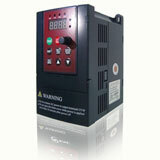 Two-way control power supply ensures the system's normal operation. Automatic bypass function can online cut off the faulty power unit and ensure three phase voltage output remains symmetrical and current output maintains balanced. Optional noninterference bypass system can help switch the motor to mains supply. Flexible control mode: local control by touch screen; remote control by I/O of built-in PLC, and host control by connection between RS485 and DCS system. The purpose of using VFD solution is to optimize the energy saving and efficiency of the entire solution. The objective also to optimize the torque requirement at maximum point at any speed range.